The 35th Infantry Regiment Association salutes our fallen brother, SSG Richwell A. Doria, who died in the service of his country on November 7th, 2006 in Kirkuk, Iraq. The cause of death was listed as Small Arms. At the time of his death Richwell was 25 years of age. He was from San Diego, California. Saturday I attended Staff Sergeant Richwell Doria's Funeral Mass along with his San Diego family and loved ones. Richwell was a member of the 2/35 in Iraq and died on November 7, 2006 after exposing himself to small arms fire while in the process of saving others. A true hero. He also served with the 2/35 in a previous combat tour in Afganistan. During the service I was taken by a sense of our collective grief as an Association and the value of our Brotherhood. I was humbled and proud to have represented the Cacti Association at the service and to have presented a letter of condolence from our president to the family. Our presence at the Mass was deeply appreciated and will not be forgotten. It was the right thing to do. Cacti Forever. A 2000 graduate of San Diego's Morse High School was killed last week in Iraq, leaving behind his young family and a grieving Filipino community. Army Staff Sgt. Richwell A. Doria, 25, died Nov. 7 in Kirkuk after being struck by small-arms fire during an air-assault mission, the Pentagon publicly announced yesterday. He is survived by his wife, Jasmine, and the couple's 4-month-old baby, Jada, of Ewa Beach, Hawaii, and many relatives in San Diego and the Philippines. Doria grew up in San Diego after moving from the Philippines when he was 11. His parents sent him to the United States so he would have opportunities he couldn't get back home, said his aunt Zenaida Anderson. He joined the Army out of high school. At that time he dismissed relatives' suggestions that he join the Navy, as an uncle had done. "He said he will do his own thing and not follow in anyone's footsteps," his aunt said, sitting at the kitchen table of her Skyline neighborhood home, and surrounded by printouts of e-mailed photographs of her nephew. Doria is at least the 35th county resident killed in Iraq or Afghanistan. Based in Hawaii, Doria served in Afghanistan for a year, returning in April 2005, Anderson said. Even though he had served abroad, he welcomed another mission, this one to Iraq. Doria left Aug. 8, just weeks after the birth of his daughter July 14. He said, "I don't want to sit around and do nothing," his aunt recalled. He was assigned to the 2nd Battalion, 35th Infantry Regiment, 3rd Brigade, 25th Infantry Regiment. His aunt said the family learned of his death Wednesday from two servicemen who came to the door. In the days that followed, many former classmates and friends gathered at the house to share memories. Doria was known for his energy. Before he left for Iraq, he was talking about plans to remodel a condo he and Jasmine were buying in Honolulu. His passion was cars, and he owned a Mercedes and a Honda Accord, Anderson said. He liked wearing designer clothing, especially Tommy Hilfiger jeans, and flashing his gold rings. When he was 11, his mother and father, Fred and Rosario Doria, sent him to live with his grandfather, San Diego resident Benito Doria. Anderson said she and her sister, Minda Doria, took care of Richwell as if he were their own child. He also was close to his uncle, Manny Doria, who is a leader in the Filipino community and an aide to Rep. Bob Filner. 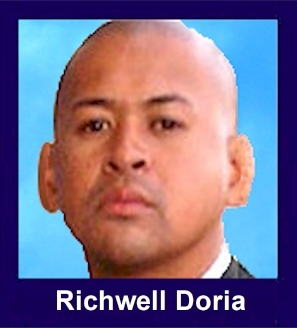 Richwell Doria attended Audubon Elementary, Keiller Middle and Morse High. Doria became a U.S. citizen about two years ago. "He called me up, he was so happy to be a citizen," Anderson said. Benito Doria, who said he doesn't speak much English, wanted to give his grandson a better life. He even legally adopted him. Now he said he feels regret that he brought him out of the Philippines and into harm's way. "He blames himself," Anderson said, her eyes filling with tears. "I told him: Maybe it was his fate to go earlier." His parents and sister, Rowena, still live in the Philippines, and his body will be sent there, Anderson said. A memorial will be held tomorrow in Honolulu. In San Diego, a Mass will be celebrated sometime next week at St. Michael's Catholic Church. The widow of Army Staff Sgt. Richwell A. Doria, who was killed by small-arms fire during an air assault and rescue mission last week in Iraq, believes that anyone who knew her husband will remember him as a hero. Doria, 25, of San Diego, was killed Nov. 7 in Kirkuk -- just a month shy of his 26th birthday. Family members said Doria had jumped out of the helicopter to get more guys when he was shot. Through family spokesman Roy Toguchi, Doria's wife Jasmine Michioka Doria said: "We're very proud of Rich. He was a very dedicated soldier, husband and father." His mother-in-law, Kazue Miyano, said in an e-mail from Las Vegas that her daughter got a call from her husband the day before he was killed in which he said he was to be honored for helping his team members when one of the Humvee's in his convoy blew up in front of him. Without hesitation, he jumped out to go and help his friends only to hear them screaming "help me." Doria was assigned to the 25th Infantry Division at Schofield Barracks in February 2001. He and his wife were married on Jan. 16, 2004 and have a 4-month-old daughter, Jada. His widow is originally from Kapaa, Kauai. "He was a stand up guy," Toguchi said, "and was there for everybody." Toguchi added that he remembers Doria as being a wonderful artist. "He loved to sketch." Doria also served a combat tour in Afghanistan in 2004 with Schofield's 3rd Brigade Combat Team. Other survivors include his parents Rosario Arzadon Doria and Fred Parajas Doria, sister Rowena Arzadon Doria, father-in-law Cory Michioka, stepmother-in-law Susan Michioka, and stepfather-in-law Derek Miyano. Doria was the eighth Schofield soldier killed in Iraq since August. A private memorial service will be held at 10 a.m. tomorrow at Schofield. A Schofield Barracks soldier who was killed in Iraq last week leaves behind a wife and a 4-month-old daughter in Honolulu and was due to be awarded the Medal of Valor for helping rescue soldiers wounded in an earlier incident, according to friends and relatives. Staff Sgt. Richwell A. Doria, 25, died Nov. 7 after being struck by small-arms fire during an air assault mission near Kirkuk in northern Iraq. Kazue Miyano, formerly of Kaua'i, said an Army chaplain came to visit her daughter, Jasmine, on O'ahu the night of Nov. 7 to tell the daughter her husband had been killed in Iraq. "They told her that Rich's team was on a rescue mission," Miyano said in an e-mail. "He jumped out of the helicopter to go and get more guys when he got attacked and shot. He was transported to the hospital but was dead on arrival. "He was a great man, and we will all miss him very much," said Miyano, of Las Vegas. She said that during the week prior to his death, Doria called relatives here to tell them about a close call. "His team was out on mission when the Humvee in front of him blew up," Miyano said, recalling a telephone conversation with Doria. She said her late son-in-law told her and others here that he jumped out of the Humvee he was in to go and help his friends who were screaming for help. "They were missing limbs but alive," Miyano said. "He started getting them out, one by one, from the mangled mess and even kept slapping one of them so that they would not slip into oblivion. He was so devastated with what he saw, he could not sleep. All he saw were his wounded friends and the parts they were missing." Miyano said Doria told family members here that all of the wounded soldiers survived thanks to him and the rest of his team members. Then Doria called his wife on the Monday prior to his own death to say that he was to be awarded the Medal of Valor. "He said he told the team that he wasn't the only one that got the wounded out, but they insisted that if it wasn't for him, they wouldn't of known what to do." Miyano said. "He was quite excited about the medal." Doria was assigned to the 3rd Brigade, 25th Infantry Division. His death was the eighth for the brigade since being deployed to Iraq in August.